My fondness for chimichurri started back in the early 90s when I was teaching in Colombia. There’s this great restaurant called Andres Carne de Res north of Bogota, and I remember having chimichurri with a steak there. First of all, the steak was one of the best I’d ever tasted (still), the stuffed grilled tomato on the side was fabulous, and the chimichurri just seemed to bring it all together. I seem to remember plenty of cilantro in their chimichurri, which is probably what drew me to it. Chimichurri has its origins in Argentina but is popular throughout South America. The basic ingredients are herbs, garlic, olive oil, paprika, and vinegar, but there many variations and it seems that no two families make it the same way. Some people like to use just parsley, or combine parsley with cilantro or oregano, and the amounts of garlic and liquid ingredients vary. Some recipes have a little heat in the form of pepper flakes, and I’ll toss in a few every now and then. Roasting the garlic is another delightful variation that lends a subtle buttery flavor. It’s a great all-purpose sauce that goes well with beef, chicken, and fish. Chimichurri is quick and easy and quite healthy with all the vitamins and minerals from the herbs and garlic. The parsley provides loads of vitamin C, which helps our bodies to absorb the iron in meat. 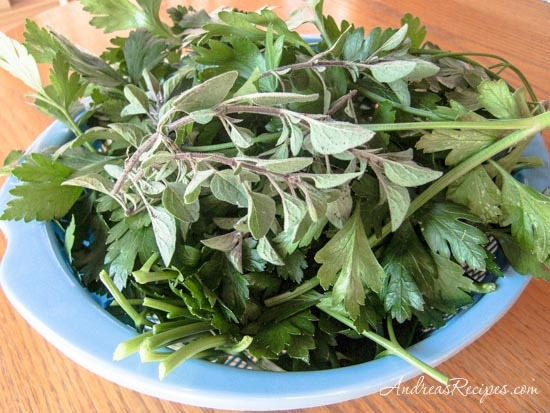 We enjoy the freshness of the parsley and oregano from our garden. I usually add cilantro, but my plants are very slow in producing right now, so no cilantro this time. This is my contribution to this week’s edition of Weekend Herb Blogging, a weekly event founded by Kalyn of Kalyn’s Kitchen. This week’s hosts are Amy and Johnny of We Are Never Full, so check out their blog next week for the round-up. 1. Put the parsley, cilantro, oregano, garlic, and about 1/4 cup (59 mil) of the olive oil into the food processor and pulse until the leaves are coarsely ground. 3. Serve immediately. Store in a lidded jar for up to one month in the refrigerator. If the olive oil thickens up, just allow the chimichurri to come to room temperature before using. Perfect for weed-end herb blogging! I enjoyed chimichurri when we were in Argentina. That looks gorgeous on the steak! I really want to try this, it looks like a delicious alternative to the sauces I usually make. Do you think it would keep in the fridge or should I use it straight away? Oh my. Love Chimichurri! And, needless to say, I love that picture! Qué maravilloso plato, Andrea. MyKitchenInHalfCups, I’m so envious of your travels in Argentina. I didn’t get around nearly as much as I would have liked when I was in Colombia. Sam, the sauce keeps for up to one month in the refrigerator. Sometimes the olive oil hardens when chilled, but it will “melt” if allowed to sit at room temperature before serving. 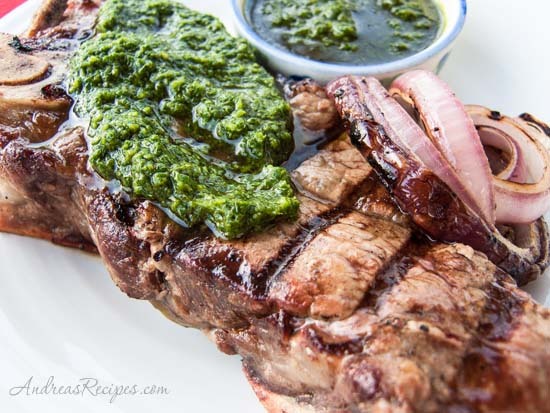 Great post for WHB; I love chimichurri sauce! I always put cilantro, and when I make it, I like a lot of sauce, completely covering the meat. I’m not a cilantro person, so I always make chimichurri with parsley. Right now, the parsley in my garden is abundant, but with colder temperatures forecast for the weekend, it seems like the perfect time to harvest and make a chimichurri sauce. And the grill is still out, too…. Thank you for your post! My overgrown cilantro is begging to be thinned and Chimichurri will be the perfect thing to make. We love chimichurri too. I usually make it with parsley and a jalapeno, and then add beer to marinate flank steak… yum. Was great to meet you at BlogHer this week! I love this sauce! I wish I had read this yesterday, I would have made some for my empanadas. Thanks for stopping by my blog. Wow, that chimichurri looks extra delicious. I have parsley growing in my garden right now and my herbs like basi, oregano, etc. are still doing great. Stop by my blog again, its always nice to meet people. I’ll keep you on my link. Take care and have a great week. I like this way more than pesto.. It’s gotta be the paprika! This is one of my very favorite things to put with meat. So much better than BBQ sauce in my opinion. I use oregano and parsely instead of cilantro. And lots of garlic. This past summer I finally got into/enjoyed Chimichurri sauce. I’m digging your grill marks…every man’s dream! Yumm! I’m actually 1/2 Colombian, but we learned to make it from some Argentinian friends. Odd as it sounds (and looks!) somehow we started putting it on the turkey at Thanksgiving and got rave reviews. It just doesn’t seem like Thanksgiving w/o Chimichurri Turkey anymore! The chimi is so good that you can just spread it over French bread and it is delicious! I don’t like parsley or cilantro. Suggestions for other herbs as replacements for the chimichurri sauce? Hi TexasLadyI. The parsley and cilantro make up the bulk of the ingredients for this recipe and both are broad leaf herbs, so it will take a lot of something else to make up the difference. That being said, you can go for an all-oregano concoction or perhaps use with basil. Another option would be a spinach arugula pesto. Hi! I love chimichurri sauce, but only had it in Argentinian restuarants up until yesterday, when I saw it in the new Fairway market. It’s a fresh-made, on-site sauce that was in the refrigerated section. My question is, there does not seem to be any non-grilling applications posted on any site. I don’t have the ability to grill in my apartment, so I was trying to think of some alternatives that wouldn not make the chicken dry. My ideas were a rollatine-type application, or a tinfoil-bake (like fish fillet) type of deal. Anyone have any suggestions? Much appreciated. Hi Michele. Yes, you can use chimichurri with meats that haven’t been grilled. It would work well with baked chicken or a rolatini, as you suggested. Thanks so much for your quick reply. I’m thinking of using olive oil and chimichurri to bake the chicken in individual tinfoil packets in the oven. Later, I’ll use more sauce on top and on some nice French Bread. I’ll let you know how it turns out and will come back after I’ve tried a roll-up type of scenario. THe George Forman grill is a great way to grill without having to grill. We use it here in Oregon during our 9 rainy months. Hi Michael. Thanks for catching my typo, sometimes my fingers get ahead of my brain. I corrected the preparation instructions. It’s delicious, I’ve been using it on everything from eggs benedict to tacos! I searched for chimichurri and I’m so glad I found this one. I made it today, and it tastes fantastic! I had heard of chimichurri but actually tasted it first in a packet inside a Trader Joe marinated steak. This tastes a lot like that one – maybe better! Thank you so much! That’s great, Andrea. So glad you enjoyed it! It’s still my favorite topping for steak and other grilled meats.